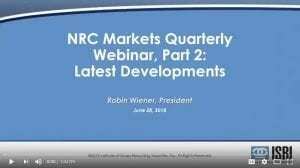 Presenter: Lisa A. Skumatz, PhD, Economic Research Associates, Inc.; Dana D’Souza, Project Manager, SERA; Michael Santulli, Environmental Analyst, SERA. The NRC has long-supported university campus recycling, first hosting caucuses of campus program managers in 1992, and then supporting a technical council in 1995. Recently, the NRC re-established the Campus Council to meet the need for stronger linkages between higher education and the SMM industry. Degree programs, career services, applied research / technology transfer, and relationships with recycling leaders are examples of the opportunities the Campus Council develops between on-campus and off-campus groups. Council leaders will provide an update of the recent activities and accomplishments as well as plans for the future. This webinar will focus on carryout plastic carryout bag legislation across the U.S. and provide a short history of carryout bag laws, outline the basic carryout bag law structures, and delve into the key components to include in a good law. The discussion will include threats of state preemption of local bag laws, including the PA state bag preemption legislation recently vetoed by Governor Wolf, and touch on how advocates in communities around the U.S. are pushing back on preemption threats. This webinar will focus on carryout plastic carryout bag legislation across the U.S. and provide a short history of carryout bag laws, outline the basic carryout bag law structures, and delve into the key components to include in a good law. The discussion will include threats of state preemption of local bag laws, including the PA state bag preemption legistlation recently vetoed by Governor Wolf, and touch on how advocates in communities around the U.S. are pushing back on preemption threats. This webinar is focused on the discussion about the future of innovation design in compostable materials for food products. This webinar will focus on compostable flex packaging and feature material specialists and the companies that are leading the way in introducing flex packaging into the wider market. Operators will also discuss the end-of-life of these products and how they are handled within the various processes of industrial composting. 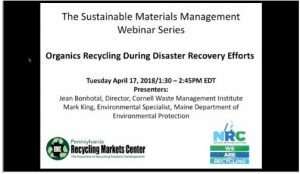 This webinar was sponsored by the Recylcers Global Warming Council, a technical council of the California Resource Recovery Association. This webinar will provide an update of the research on the utilization of composting as a preferred method to safely manage bovine, swine, poultry and other animal mortalities for both small and large operations as well as mass animal die-offs due to disease outbreaks. The leader of the county’s largest municipal sanitation department will discuss the goal of contributing Zero Waste to Landfills by 2030 by improving and expanding existing successful reduction, reuse and waste reduction programs, as well as implementing new initiatives such as organics, public housing and e-scrap recycling; education; and private sector engagement. Plastic recycling is complicated and requires many factors to be successful. This presentation will answer two main questions related to successful plastics recycling: Why does quality matter, and how to collect for quality? The discussion will include market drivers and influences, historical pricing, current market conditions and industry-based education and outreach efforts to address quality starting at the curbside bin through end users related to both film and rigid plastic packaging. The Closed Loop Fund (CLF) is a social impact fund investing $100M to increase the recycling of products and packaging. Its goal is to strategically remove the key obstacles to expanding recycling in order to attract additional, more affordable capital to the industry, increase recycling access, and help scale solutions that improve recycling profitability. An update of this massive social endeavor that was created in 2014 will be provided. An expert in the field of solid waste industry economic research will delve into commercial recycling and discuss the factors when considering entry into this sector, including its makeup, percentage of the recycling stream, invoicing, costs, and incentives. Presenter: Lisa A. Skumatz, PhD, Economic Research Associates, Inc.
An update from the Trade Association for PET packaging in the U.S., Canada and Mexico will be presented and will include current market conditions as well as the challenges faced by the recycling industry with regard to PET recycling. Marketing and promoting a nonprofit organization is a complex and ongoing task. Learn how to avoid common mistakes and how to succeed at acquiring and sustaining funding for your NPO. 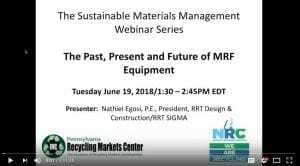 This webinar will provide an overview some of the newer products and technologies that have been introduced recently into the waste/recycling industry that can improve productivity and sustainability efforts. Experts in the recycled metals, paper and plastics industries will provide an update focusing on the domestic and global recovered plastics markets and emerging processing technologies. Historically, the rates of recovery and recycling of agricultural plastics have been low as it is cumbersome to handle, difficult to keep clean and rarely meets post-recycling market specifications. However, efficient recycling infrastructure is emerging to help agricultural plastics get to post-recycling markets. This webinar will focus on the development of collection and recycling best practices for managing waste agricultural plastics; and provide examples of local initiatives of agricultural and recycling communities, integration with existing materials management infrastructure, increasing market demand for recovered agricultural plastic, and extended producer responsibility demonstrated by the manufacturers and distributors of agricultural plastics products. The recovery and recycling of cellulose-based ceiling tiles can help building owners maintain their “green” image during demolition, rehabilitation and remodeling projects. This webinar will highlight examples of successful ceiling tile programs and how they are set-up and executed. It will also discuss how ceiling tile recycling fits in with the Leadership in Energy & Environmental Design (LEED) green building certification program that recognizes building strategies and practices. The recycling of consumer electronics has grown substantially in recent years. There can be safety hazards from handling consumer electronics in general, and specific components may have distinct hazardous properties. This webinar will discuss federal, state, and local safety regulations; client specific procedures and programs; and applicable industry standards pertaining to the handling of recycled electronic scrap. Learn from the founder of a wiki-based website that teaches people how to fix almost anything and empowers individuals to share their technical knowledge with the rest of the world. Social media provides many benefits for organizations involved in sustainability, including increased consumer trust. While benefiting responsible organizations by enhancing their brand reputations, it is also a platform capable of exerting tremendous pressure on irresponsible businesses. This webinar focuses on the power of new media… and the expectations that companies use social media to convey their sustainability message. 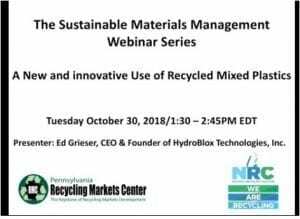 This webinar will discuss the efforts to develop a viable collection, processing and manufacturing infrastructure for recycled gypsum wallboard material. Learn how recycling companies have diverted large quantities of waste gypsum wallboard from landfilling and developed new products out of this material. Recycle By Design & Michigan Recycling HackAThon: What you need to know! Don’t miss this opportunity to learn more about the exciting and innovative opportunities kicking-off in Michigan this November! You won’t want to miss the statewide Michigan Recycling HackAThon or Recycle By Design Challenge. This webinar will detail: What Recycle By Design is, how to start a team and get involved with Recycle By Design, what the Michigan Recycling HackAThon is, what you can expect from attending the Michigan Recycling HackAThon, and how to sign up and not miss either of these great opportunities. The presentation will provide a high-level snapshot summary of Burt’s Bees Packaging Standard. It will cover what Burt’s ideal state looks like, and how they are designing recyclability into their packaging today. A combination of new federal/state/local regulatory requirements, private sector focus, development of new(er) conversion technologies, and socio-political movements have yielded a paradigm shift in how organic and other waste materials are being managed. While Pennsylvania is not at the forefront of this change, other communities are changing the way organics are managed. This emerging market has yielded significant new opportunities in waste diversion and conversion into various forms of renewable energy such as power, heat, and renewable natural gas and other saleable byproducts, such as compost. Collectively referred to as the bioenergy and waste to energy (WtE) market sector, the sector is no longer focused on incineration and now on clean technologies such as anaerobic digestion (AD). Commonly utilized in wastewater treatment plants, this well documented technology is being used for the organic management of municipal solid waste throughout Europe and now rapidly growing in the US. Presenter: Keith Henn, Vice President, Bioenergy, Tetra Tech, Inc. 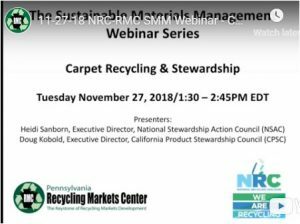 This webinar will discuss market-based solutions to increase landfill diversion and recycling of post-consumer carpet, as well as advancements regarding designing carpeting for recyclability. Vermicompost is the product or process of composting using worms and has been found to be an excellent, nutrient-rich soil conditioner. This webinar will discuss which how vermicompost is made and utilized. Safely managing animal moralities is an ever-increasing challenge to the agricultural community. Composting is now a preferred management method. This webinar discusses the various composting methods for bovine, swine, poultry and marine mammals. A carbon credit (aka carbon offset) is a financial instrument that represents 1 ton of CO2 (carbon dioxide) or CO2e (carbon dioxide equivalent gases) removed or reduced from the atmosphere from an emission reduction project. Learn about current governmental carbon credit programs and how industry and private individuals are utilizing these programs to offset emissions that are generated. Experts in the recycled paper and plastics industries will provide an update focusing on the domestic and global recovered plastics markets and emerging processing technologies. The Benefits of the Construction and Demolition Waste Recycling Industry in the U.S.
Townsend of the University of Florida. The white paper measures the economic impact and environmental benefits of C&D recycling based on an industry survey of operating costs, production rates and end market values. From the survey, data was extrapolated to provide an estimate how many green jobs the industry provides, economic value, and environmental benefits, such as greenhouse gases reduced and landfill space saved. Many mattress materials are made from recycled and renewable materials and can be recycled at the end of their useful life for use in other products. Learn how the sleep products industry is developing partnerships and programs to establish workable recycling system. This webinar will discuss a major component of recycled construction and demolition waste and the markets and uses for pre- and post consumer asphalt shingles. This webinar will provide an overview of the relatively new use of “tea” extracted from compost. Recent research has found that compost tea, when produced and applied correctly, can provide a number of benefits to plants, including protection from disease-causing organisms, increased nutrient uptake, retention and availability, and improve the water-holding capacity and structure in the in the soil. 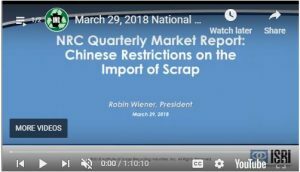 This webinar provides insight on the computer hardware refurbishing and recycling industry and the complexity of factors such as supply and demand, and the hard-to-assess and fast-decaying value of returned hardware during the refurbishing and recycling process. Speaker: Peter Sobata, Founder & CEO, recoupIT, inc. Many marketers make deceptive or untruthful claims of their product’s environmental attributes. A Federal Trade Commission representative will explain how their “Green Guides” are designed to ensure claims about carbon offsets, “green” certifications and seals, and renewable or recycled materials are valid. Speaker: Julia Solomon Ensor, Esq., Division of Enforcement, Bureau of Consumer Protection and Federal Trade Commission, Washington, D.C. This webinar will discuss the innovative use of recycled ground tire rubber (GTR) in highway construction and maintenance projects-particularly in hot asphalt mixes. An expert in the development application of asphalt-based materials will discuss his experiences and resulting benefits with using recycled rubber in asphalt. This webinar will discuss the importance of waste reduction, reuse and recycling, in a lean manufacturing setting. An industry expert will provide his insights on his company’s lean journey towards sustainability. This webinar will provide an overview of PET Thermoform recycling, from early research and development efforts; the state of the market today; and a reclaimer’s experience in recycling PET thermoforms with PET bottles. An industry expert will provide an update on the state of scrap tire recycling market in the U.S. and the existing and developing uses of scrap tires. This webinar will focus on the economic, environmental and technological considerations of converting truck fleets to run on greener fuels such as natural gas and biodiesel. Industry experts will present and discuss this emerging trend. Speakers: Dave Hurst, Principal Research Analyst, Navigant Consulting, Inc., Detroit, MI and Bob King, Principal Founder and Chairman of the Board, Pacific Biodiesel Technologies, LLC, Kahului, HI. This webinar will provide an overview of the used clothing industry and will address its many and sometimes complicated aspects, including collection, processing, exportation and reuse. Four industry experts will present a detailed discussion on each of these aspects. The Zero Waste Brand: What is it and Who Certifies it? In the last 2 years, everyone is talking about Zero Waste and it has become THE goal for leaders of waste management and recycling in the world. However, not everyone means the same thing when they say Zero Waste. Join this webinar to learn more about the true meaning of Zero Waste that is embraced by the world’s environmental, recycling and Zero Waste leaders, highlighting particularly the work of the Zero Waste International Alliance and the U.S. Zero Waste Business Council. The Recycled Paper Markets Roller-Coaster Ride…totally unpredictable…up, down and sideways…where will it go next? 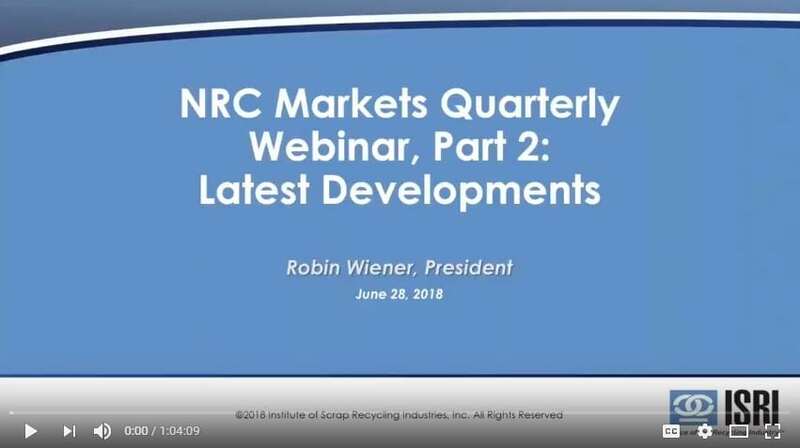 This webinar will cover the 3 “U”s of the recycled paper markets: Unique, Unpredictable, Unprecedented. Why are these markets like this and what will be coming next? Learn about the past trends and the factors that are influencing the economics of paper recycling, from one of the largest paper mill groups that consumes only 100% recycled content for their paper-making process. This webinar will provide an overview of the variety of agronomic benefits derived from using compost. The physical, chemical and biological benefits of various compost products will be described in a manner so that prospective users will know what they have to offer. An overview of the United States Composting Council’s “Seal of Testing Assurance Program” will also be provided. Recycling has been around for hundreds of years. Through innovation and new technologies the process has grown into a multi-billion dollar industry across dozens of markets. Steel, as North America’s #1 Most Recycled Material, is recycled more than paper, plastic, aluminum and glass – combined. Learn what steel is doing right. Who are the players in the recycling wheel that keep the steel scrap industry moving? And why is it important for everyone that the most recycled material keeps improving? This webinar will discuss the business of the steel recycling industry and the importance of its continued success. Importance of Verification and Auditing: Validation and audit claims, The value of third-party certification, Federal Trade Commission Guidelines and Cone research. LEED Standard and Recycling – How Do They Fit Together? Green building is no longer a trend, but rather a focus of the future in the building industry. New Green Building standards and codes are moving the green building market from voluntary to mandatory. The Leadership in Energy and Environmental Design (LEED) standard is a primary vehicle for promoting sustainable design and construction and requires the use of materials and products with recycled content. This session will help you to learn how to acquire those coveted LEED rating points by reusing and recycling demolition waste, utilizing recycled content building materials, and establishing LEED building recycling programs. A recent report states that single stream processing can result in increased glass residue when compared to dual stream processing. Learn how one of the largest recycled glass processors in North America is addressing this issue and creating opportunities with this material. In addition, we will hear about how a state department of transportation agency has developed specifications for the use of triple mix recycled glass for highway construction projects. Speakers: Rocksroy C. Baily, Environmental Scientist, Apex Environmental, Inc. and Heather Bunn, Regional Sourcing Manager, Strategic Materials, Inc.
Organics – Food Waste Composting – Does it add up? The bottom line often dictates if a generator will decide to separate food discards. This webinar will discuss the critical factors waste generators must consider when developing and implementing a food waste diversion program. Haulers must also think outside the front-load box when choosing equipment, establishing routing and providing customer service. And finally, food waste composters must often deal with added regulatory issues as well as operational responsibilities. Social Networking and E-Marketing, Where Do I begin? Learn how to ready your company for entry into social media marketing and how to develop a social media marketing plan. Discover ways to measure your return. Enjoy tips from the pros on how to stay focused, how to promote, how to engage, how much time you should be spending, and more! Speakers: Joe Knezic, VP Creative Services and Branding, PPO&S Inc. This webinar will explore how consumers can get the most useful life out of existing products, and how some products can be repurposed to keep them out of the waste stream even longer. In addition to an overview on reuse, specific topics will include building material reuse, creative reuse, and online reuse marketplaces. The expert panel of speakers will also explain ways municipal officials, community leaders, and educators can promote reuse in their communities. The Importance of Third Party Certification: Don’t Get Greenwashed! The 2010 TerraChoice Greenwash Report states that as many as 95 percent of the consumer products that claim to be “green” either provide no proof, make vague claims, or actually misrepresent themselves. Deceptive green marketing is called “greenwashing.” Learn how an independent review of a claim is critical to credibility in today’s marketplace. This webinar will cover how municipal governments are propelling policy changes to ensure sustainable management of end-of-life products such as batteries, carpeting, and products containing mercury and other harmful substances. Presenters will provide sample resolutions that can be adapted for your community, discuss case studies of communities that have already enacted policies, and talk about how local movements lead to policy change at the state and national level. Speakers will include leaders from state and national product stewardship organizations, including Katherine Bourbeau of the New York State Product Stewardship Council and Jennifer Holliday of the Vermont Product Stewardship Council. Hosted by the Environmental Finance Center, this webinar will explore how consumers and municipalities alike can get the highest and best use possible out of electronic waste. As technology continues to advance, countless numbers of computers, cell phones, televisions, and other electronics need to be diverted from the waste stream. Panelists will discuss e-waste recycling resources for consumers, educators, municipal officials, and those in the solid waste management industry; best practices for establishing an e-waste reuse program; and Extended Producer Responsibilitiy e-waste laws, such as New York State’s new law.